The Solebury School occupies ninety-nine rural acres in Solebury Township, in Bucks County, Pennsylvania. Founded in 1925, it is an independent, private preparatory school for grades 7 through 12. The school serves 220 boarding and day students in an environment that supports and responds to a multicultural, coeducational student population. Despite its close proximity to the urban centers of New York and Philadelphia, the school maintains a quiet, country character and intimate scale associated with small, individual buildings set amongst trees and meadows. The connection to the outdoors is one of the most valued aspects of the experience at Solebury for both students and teachers. Preserving the quality of the school’s environment is a school mandate. The architectural development of the Abbe Science Center at Solebury School is informed by the school’s profound respect for the individual, the need for places that stimulate interaction amongst students and their instructors, and modern interpretations of the vernacular architecture common to this part of Bucks County. It incorporates natural materials that will age with time, and sustainable strategies to create a healthy and responsive architecture. The building’s distinctive cedar skin is formed of custom-milled wood profiles and deep shadow lines. At the entry nearest the center of campus, the wood slats open to allow light and air to filter through it. At the two-story lounge, the wood skin shifts in both scale and texture. A series of small rectangular apertures within the fabric of this wall frame vignettes of the expansive landscape beyond. The building is organized by single-loaded corridors along the west and south elevations. The corridors are lined by full-height glass doors that allow the spaces to open directly to the outside. They are important thermal buffers mediating temperature and light in the classrooms and science labs, while still allowing connections with the outside. The south-facing corridor near the laboratories uses a deeply-colored concrete floor to collect and re-radiate sun to interior spaces during the winter months. The corridors meet in a commons, or lounge area, at the corner of the building. Located adjacent to a faculty workroom and near student restrooms, the lounge is a space for meeting, study, or reflection. The building’s science laboratories allow for areas of group interaction and individual experimentation. Similarly, the classrooms have areas for lectures/discussion as well as spaces for individual study. Each room has individual temperature control, but all are served by a building-wide energy recovery system. In addition, a masonry trombé wall captures winter heat in the greenhouse and uses it to heat the adjacent biology laboratory. Solebury School Abbe Science Center. North Entrance to Common Area. Photo by Albert Vecerka | ESTO. Interior Lounge. Photo by Albert Vecerka | ESTO. South Elevation at Entry. Photo by Albert Vecerka | ESTO. Exterior of Classroom Wing. Photo by Bradley Walters. Exterior Detail. Photo by Albert Vecerka | ESTO. Detail of Exterior Wood Systems. Photo by Bradley Walters. Section + Elevation at Two-Story Common Area. Image by Jose Atienza. Section + Elevation at Classrooms and Laboratories. Image by Jose Atienza. Corridor to Science Classrooms. Photo by Albert Vecerka | ESTO. Chemistry Laboratory. Photo by Albert Vecerka | ESTO. West Elevation. Photo by Albert Vecerka | ESTO. Owner: Solebury School, New Hope PA | www.solebury.org. Headmaster: John D. Brown. Architect: RMJM (formerly Hillier Architecture), 500 Alexander Park, Princeton NJ 08543-6395 | Tel. 609.452.8888 | Fax. 609.452.8332 | www.rmjm.com. Principal-in-Charge + Lead Designer: Barbara A. Hillier; Designer + Project Manager: Bradley Walters; Designer + Project Architect: José A. Atienza; Senior Technical Architect: Charlie Maira; Delineator: Kevin Westerbeck; Signage: Despina Raggousis. Structure/Mechanical/Electrical/Plumbing/Fire Protection Engineers: Greenman-Pedersen Inc. (formerly Hillier Engineering & Technologies) | www.gpinet.com. Structural: Marc Bowen; Mechanical: Frederick Broberg; Electrical: James Pfluger; Plumbing: Michael Petrochko. General Contractor/Construction Manager: E. Allen Reeves, Inc., 1145 York Road, Abington, PA 19001 | Tel. 215.884.2255 | Fax. 215.884.7059 | www.eareeves.com. President: Robert N. Reeves, Jr.; Project Manager: Daryl Boorse; Project Superintendent: Jared Giles; Project Estimator: Samuel Moore. Landscape Architect: Kevin Kester, Van Cleef Engineering Associates. Lighting: Sandra M. Stashik, Grenald Waldron Associates | www.gwalighting.com. Photography: Bradley Walters, Jose Atienza, Albert Vecerka | ESTO | www.esto.com. Taggart, Jim, ed. “Abbe Science Center, Solebury School.” The Cedar Book: Inspiration for the Use of Western Red Cedar. Canada: Janam Publications, Inc., October 2007. 36-41. Youblin, Hou, ed. 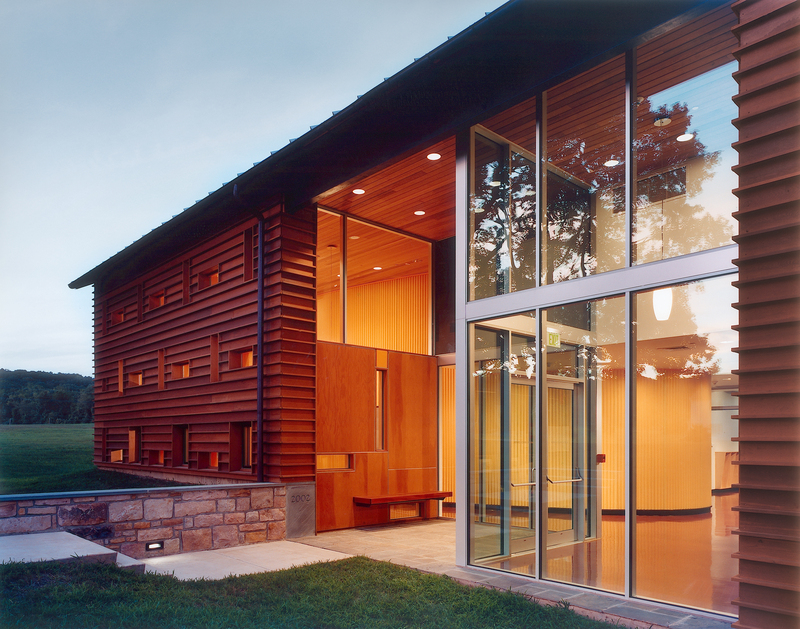 “Abbe Science Center in Solebury School.” Urbanism and Architecture, May 2006, No. 20, Con. 20, 60-62. “A Corn-Crib Exposé,” A+D (Architecture + Design: A Journal of Indian Architecture), Vol. XXII, No. 10, October 2005. Heinze, Jacqueline. “More than Just a Pretty Space.” Scholastic Administrator, Dec/Jan 2005. Griffith, Don (ed.). The Wood Design Awards 2004: A North American Program of Architectural Excellence. Halifax: Tuns Press, 2004. “Innovative design blends past with present.” The New Hope Gazette. 1 January 2004. Windows: Aluminum: Kawneer – Aluminum frame custom windows in the classrooms. Glazing: Glass: Low E Insulating Glass (Blue Green Tint) by Alderfer Glass Co.
Furnishings: Chairs: Classroom Chairs by Smith System; Lounge Chairs by Cape Furniture; Classroom Desks by Smith System; Lounge Tables by Fixtures Furniture.